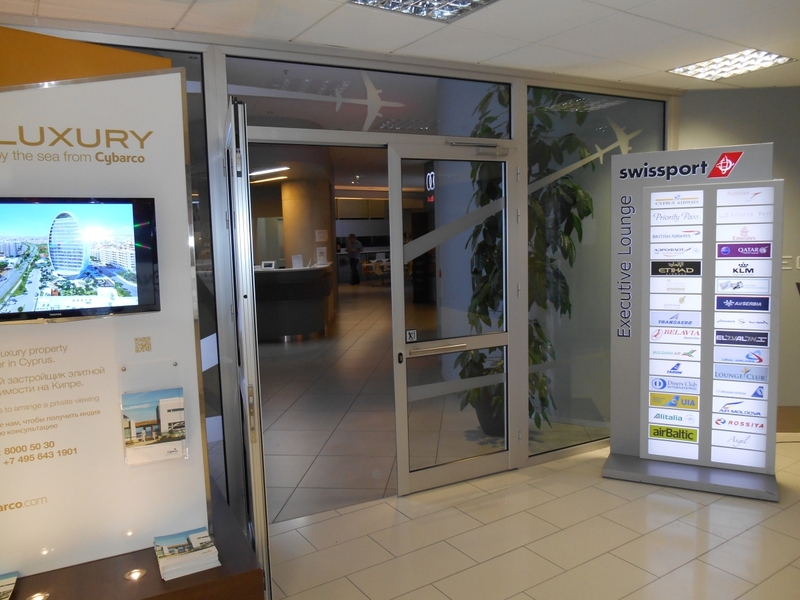 There are currently two Lounges available to passengers at Larnaca Airport and these are the Swissport Executive Lounge and Aegean Business Lounge. To use these Lounges you must hold a valid ticket or card that entitles you access to the Lounges or you must have pre-booked your entry in advance. Both the Lounges at Larnaca International Airport are designed to offer passengers all the facilities one would expect from an Airport Lounge and to make your visit more enjoyable and more comfortable. Unfortunately, air travel does have delays and lets face it, airports are not the best places to be if you have to sit around waiting for your flight. Even when there are no delays, you will still need to occupy your time before boarding the plane for your flight. The Larnaca Airport Lounges are the perfect way to relax before your flight without enduring all the hussle and bustle of the main airport Departures Terminal. Inside the Airport Lounges at Larnaca Airport you can enjoy a number of different facilities including food and drink. The fact is, if you are going to be at the airport and buying a meal and a few drinks whilst you are there, you might as well pay to use the Airport Lounges as it can often work out the same price. The added bonus is that once you are inside the Airport Lounges, your food and drinks are free and you can enjoy waiting for your flight in comfort and if you experience any delays, it is much nicer to be in one of the Lounges than sat in the main Departures Lounge! The Airport Lounges at Larnaca are located Airside in the Departures area of the airport. Once you have passed through the Airport Security area at Larnaca, you will see all the Duty Free shops and restaurants and bars. If you keep left and head towards ‘Costa Coffee’ and then follow the corridor around to the left, you will see the signs for the Airport Lounges. The Lounges are located on the upper floor of the terminal building and you can either take the lift or stairs to the upper level. 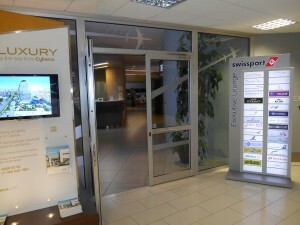 The Swissport Executive Lounge at Larnaca is open 24/7 and provides many facilities in a spacious area that can accommodate up to 190 passengers. It offers room for dining and reading and has a large outside terrace for passengers to relax before their flight. The Swissport Executive Lounge at Larnaca has a designated area for children which has games to help keep them amused! Smokers can enjoy the designated smoking area if they wish to have a smoke whilst in the Lounge. The airport Lounge is fully air conditioned which is a luxury in the peak seasons and has a number of different TV and Cable channels for passengers to watch. There is also WiFi available inside the Lounge with conference facilities if passengers require them. There are monitors positioned overead that display all the latest flight information which means you can keep an eye on all your flight information without leaving the Lounge. Showers are available inside the Lounge that passengers can use if they wish to freshen up befor e their flight. Passengers using the Lounges at the airport can enjoy a variety of both hot and cold snacks along with alcoholic and non-alcoholic beverages. There is also a salad bar if you prefer a lighter snack and the Lounge offers a selection of fresh fruit, sweets and deserts. Inside the Airport Lounges at Larnaca, passengers are offered a selection of reading materials such as daily local and International newspapers as well as a selection of popular magazines. These are all complimentary inside the lounge to all passengers. Many passengers who use the Airport Lounges are business professionals and due to this fact, there are many facilities available if you wish to use them for business such as Fax machines, scanners, printers and photo copiers. The Lounge also has a Business Centre which is equipped with Pc’s. As we mentioned earlier, there are also conference facilities available for anyone who requires them. The Airport Lounges are designed to offer access to persons with reduced mobility. As with the Swissport Executive Lounge, the Aegean Business Lounge at Larnaca offers passengers a number of different facilities inside their Lounge. The Aegean Business Lounge is available to all passengers flying Aegean Business class as well as other card holders who are entitled to use the Lounge. Passengers using the Aegean Business Lounge can enjoy a variety of complimentary drinks and snacks from the buffet as well as Internet connection, comfy seating and reading material. If you are flying from Larnaca and would like to relax and enjoy a little more luxury before your flight, then the Airport lounges could be your perfect solution. There are several ways in which you can access the Lounges at Larnaca Airport and even if you are not flying Business Class, you can still enjoy all the facilities that the Larnaca Airport Lounges have to offer.